130 kilometres of coast to suit all tastes! The Abruzzo coastline is very varied:	wide, sandy shores, high, jagged cliffs, narrow creeks, pebble beaches and some areas still completely undeveloped. There are hundreds of restaurants and excellent beach facilities ready to satisfy all the needs of holidaymakers. In the north, Martinsicuro has wide, sandy beaches, and a beautiful tower embellished with renaissance friezes. Tortoreto Lido follows with its beach adorned with palms and marine pines, restaurants, campsites, discos, sports centres and a beautiful water park. Further south Alba Adriatica has a beach edged by a pinewood. Giulianova Lido provides a good mooring and berth for pleasure craft. The upper town offers, apart from the many shops, art galleries and antique shops, a municipal picture gallery with very interesting paintings, an impressive renaissance cathedral, a striking tower and the beautiful ruins of the ancient medieval walls. As you travel south there are numerous beautiful beaches including Pineto with its pinewood right on the beach and a picturesque seafront. Silvi is on the territorial line between Teramo and Pescara with a 4 kilometre long beach, good hotel facilities, night clubs and many cultural and sporting enterprises. Very close to Montesilvano Marina, famous for its long sandy shores and modern hotels, lies Marina di Citta' S. Angelo with stretches of pebbly beach, rich in Mediterranean vegetation. In less than 15 minutes it is possible to reach Citta' S. Angelo village with its XIII century collegiate church of S. Michele famous for its 1500's portico. The churches of S. Chiara and S. Agostino's are also worth a visit. Just a few miles south is Pescara, a modern, young city, where the metropolitan life can be enjoyed to its full. 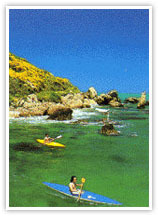 The long beach, night clubs, tourist harbour, sports centres, and many cultural experiences. Among these are the birthplaces of Gabriele D'Annunzio and Ennio Flaiano, the antique Bagno Borbonico with the Museo delle Genti d'Abruzzo (Museum of the Abruzzo People) and the cathedral of S. Cetteo. Heading inland from Pescara, it is possible to visit the countryside: hills, mountains, the National Park of Abruzzo, and that of the Majella, the small piedmont towns. Leaving Pescara for Francavilla al Mare, well-known not only for its beach, but for having been patronized by Gabriele D'Annunzio and the artist, Francesco Paolo Michetti, who, in his studio, gave hospitality to artists and intellectuals. Chieti is a short drive inland and is one of Italy's oldest cities that still boasts Roman, medieval, and renaissance ruins bearing witness to ancient splendours. 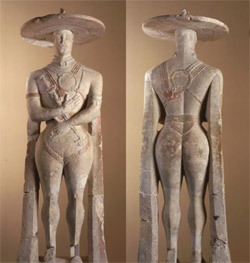 Here, it is a must to visit The National Museum of Archaeology where you can see the famous statue of the Guerriero di Capestrano (the Capestrano warrior). After Francavilla the coastline changes appearance and before getting to Ortona the beach becomes high, jagged cliffs interspersed with small coves. From here there are boat trips to the Isole Tremiti (Tremiti Islands). Continuing south, San Vito Chietino offers a flat beach which, further down, changes to rocks where you can still find several "travocchi", archaic instruments used for fishing. Moving further south, the shoreline, once again, becomes level and Fossacesia, Torino di Sangro and Casalbordino enjoy the seemingly endless sandy beach. At Torino di Sangro it is still possible to see the dunes that, up to twenty years ago, were a common feature of the Abruzzo coastline. 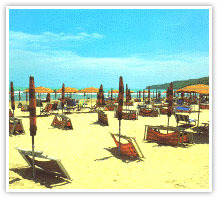 The gulf of Vasto Marina has a long beach with good facilities, sports centres, and several campsites. The historic centre, in the upper part, offers various points of interest: the Castello of the XIII century, the Palazzo d'Avalos, built in the 1400's, the bell-tower of Santa Maria Maggiore. 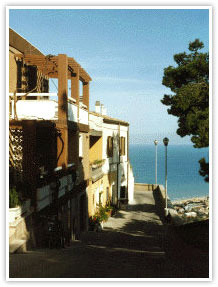 On the Molise border is the last seaside resort, San Salvo Marina.